Iron Maiden fans take note: April 21, 2009 is the most important date of the year. That's when the legendary heavy metal outfit will release their latest cinematic endeavour, Iron Maiden: Flight 666. Created in conjunction with EMI Records, Universal (USA) and Arts Alliance Media, Iron Maiden: Flight 666 purports to be a powerful documentary captured by Toronto-based Metal: A Headbanger's Journey creators Banger Productions. "Bangers" Scot McFayden and Sam Dunn followed the band during their high-profile Somewhere Back In Time World Tour last year, filming everything they could fit into the viewfinder. Why such hoopla over a tour? 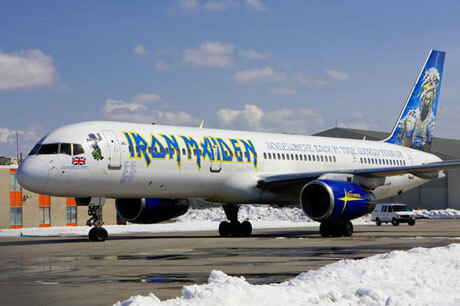 As many will recall, this was the jaunt that saw Maiden customize a Boeing 757 airliner dubbed "Ed Force One" and piloted by singer Bruce Dickinson, and fly it around the world to perform at 23 sold-out stadium and arena gigs in the likes of Asia, Australia and North, Central and South America in just 45 days. Touted to be an intense look at the inner-workings of Iron Maiden, McFadyen and Dunn have ensured the film is more than just your conventional concert footage, venturing into the typically unseen aspects of road life - punishing show schedules, the struggle with time zones, the pressures of ensuring that every performance was seamless and energetic - all captured candidly and from fresh angles to boot.